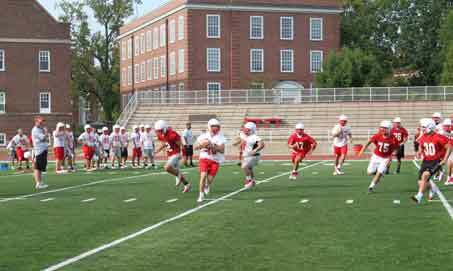 Two days into practice, Wabash College head football coach Erik Raeburn likes what he's seen from his 2012 Little Giants. 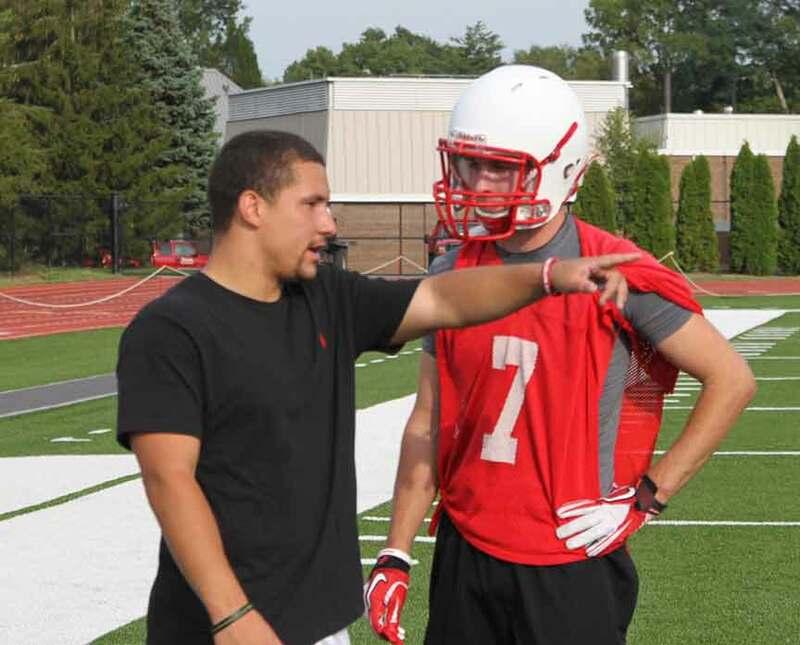 Wabash is coming off a 12-1 season and a sixth North Coast Athletic Conference title in 2011. The Little Giants advanced to the quarterfinals of the NCAA Division III Football Playoffs with a 38-20 victory over Illinois College and thrilling, come-from-behind 29-28 win against sixth-ranked North Central College. Wabash lost its quarterfinal contest against national runner-up Mount Union 20-8. 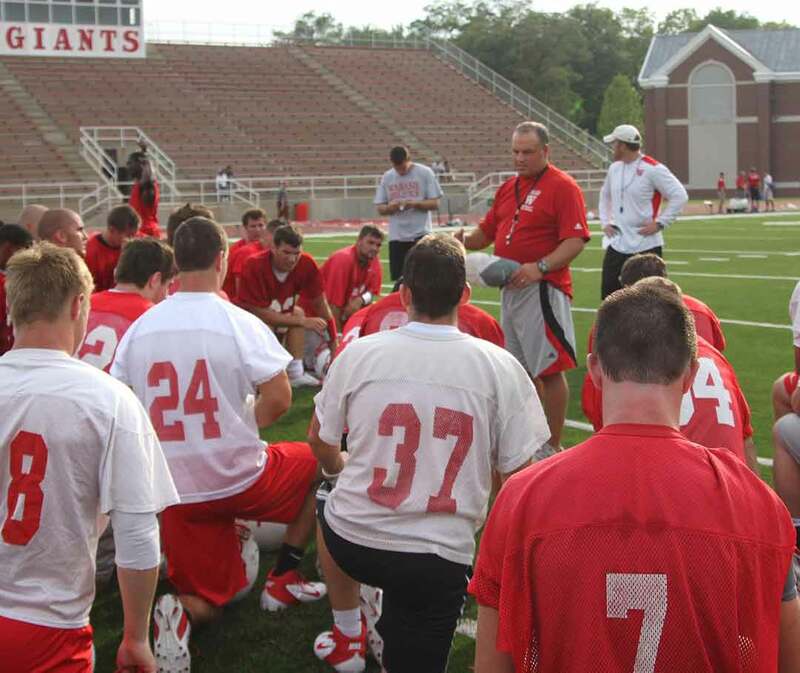 The Little Giants are the favorite among NCAC football coaches to repeat as league champions this season. The 2012 squad features 11 returning starters from last year's team. Seven of those players line up on the defensive side of the football, a unit that finished in the top-15 in the nation in points allowed per game (12.92 ppg), rushing defense (78.08 ypg), and total defense (249.46 ypg). CJ Gum, two-time NCAC Defensive Player of the Year, graduated after leading Wabash with 105 total tackles. However, the next four top tacklers are back, led by two youngsters. Sophomore linebackers Cody Buresh and AJ Akinribade were second and third on the team with 72 and 65 tackles, respectively, in their rookie seasons. Buresh added 3-1/2 sacks and 9-1/2 tackles for losses to earn Honorable Mention All-NCAC honors. Akinribade tied for the team lead with six sacks and ranked second with 14-1/2 tackles for losses. He was a First Team All-NCAC pick while becoming the first Little Giant to be named NCAC Newcomer of the Year. Re-joining Buresh and Akrinibade at linebacker is junior Nate Scola. The Arizona native played in five games and made 31 tackles in 2011 before a knee injury ended his season. Senior Kyle Bottos is also expected to make the move from defensive back to linebacker after a knee injury shortened his junior season. Senior Pat Clegg and juniors Zach Breuckman and Jorge Diaz-Aguilar will anchor the defensive line for Wabash. Clegg, a First Team All-NCAC selection at defensive tackle, recorded 63 total tackles, including a team-high 19 tackles for losses totaling 60 yards. His six sacks tied for team-high honors. Diaz-Aguilar started all 13 games at defensive end, finishing the season with 44 tackles. He also picked up three of the Little Giants' eight blocked kicks. Breuckman finished with 12 tackles in eight games, earning starts in the final six of the final seven contests of the season. Charlie Kolisek added 10 tackles in nine games and could earn the final starting spot in line of the 4-3 defense. The brothers Hodges will enjoy one final season together at cornerback. Senior Austin was joined last year by his younger brother Houston — a sophomore this season — as the starting corners. The two combined for 64 tackles and six interceptions, with Austin earning First Team All-NCAC honors while Houston was an Honorable Mention selection. Jonathon Koop started the final four games of the regular season, but still finished fourth on the team in total tackles with 64. Denzel Wilkins played primarily as a fifth defensive back as a freshman and should battle for a starting spot this season. He picked off two passes, including one for a 28-yard TD return against DePauw in the Monon Bell Classic. Only four starters are back from last year's team that averaged 31.0 points and 352.2 yards a game. Leading the way up front is Weston Kitley. The senior tackle earned All-America honors in 2010 and is a D3football.com Preseason All-America selection this year. While he is the only returning starter on the offensive line, several returning players bring game-day experience to the 2012 Wabash team. Mark Riffle, Scott Campbell, Andrew Weyler, and Patrick Singleton all saw action on the offensive line last season and could move into a starting spot this year. Kitley has seen some early positive results of his teammates' spring and summer preparation. Senior Chase Belton is 18-1 during his career as the starting quarterback for Wabash. He threw for 2,022 yards and 20 TDs last year, completing 142-of-262 passes. Belton missed one playoff game against North Central with a knee injury, but should be healthy to start the 2012 campaign. Junior Andy Walsh played in 5 games, throwing for 27 yards. Senior Vince Kenney has seen limited action over his career, but will also be in the mix. James Kraus and Jeff Bell are the only returning starters as receivers for the Little Giants. Kraus was third on the team in receptions, catching 12 passes for 2141 yards and two scores. Bell made three receptions for 19 yards, but two of his three catches went for touchdowns as a tight end for the Little Giants. Junior Sean Hildebrand is poised for a breakout season after starting four games last season. He caught 12 passes for 206 yards. Senior Vann Hunt started all 13 games at running back last year, rushing for a team-high 744 yards and four TDs while earning Second Team All-NCAC honors. Tyler Holmes and Derek Rowe join Hunt in the backfield, as do converted defensive players Troy Meyers and Andrew Gibson. Holmes finished with 112 carries for 494 yards and four scores in 2011. Rowe ran for 195 yards and one score. Belton proved his mobility in the backfield, rushing for 461 yards and 10 TDs last season. Meyers saw limited duty as a running back last season, while Gibson started as a defensive back in 13 games. Senior Cameron Sobleski and junior Ian MacDougall are back to handle the kicking duties. Sobleski averaged 39.9 yards per punt last season. MacDougall connected on 48 extra points and hit 5-of-10 field goal attempts in his first season as the Little Giants' kicker after playing soccer as a freshman. Wabash will need to answer some questions in its return game. The Little Giants lost two-time All-American Wes Chamblee to graduation. Chamblee returned four kickoff and punt returns for touchdowns last year and ranked third in Division III with an average of 21.85 yards per punt return. Chamblee averaged 25.9 yards per kickoff return. A group of 50 freshmen are joined by junior transfer Jon Laird as newcomers to the Wabash squad in 2012. Several are expected to make an immediate impact and could vie for starting positions. “Obviously with another large group of first-year players you're starting from scratch in many ways,” Raeburn said. “You're really coaching a different team, so any comparisons to last year really don't work. You hope the older, experienced players pick up close to where they left off last season. The Little Giants will open the season ranked 10th in the D3football.com preseason poll, the highest preseason ranking for Wabash by the national web site. The season begins on Saturday, September 8 with a non-conference road game at Hanover, followed by an NCAC contest on September 15 at Denison. The Little Giants open the home portion of the season Saturday, September 22 against Allegheny.